Brandan Montclare, Natacha Bustos and Tamra Bonvillain bring us the latest installment of Moon G and Devil D’s first adventures into the cosmos. The Girl Moon story-arc continues as a temper tantrum by Illa The Living Moon, coupled with a malfunction of the Omniwave Projector, sent Lunella and Double D to an alternate dimension where they landed on an alternate earth and met a very alternate version of themselves. 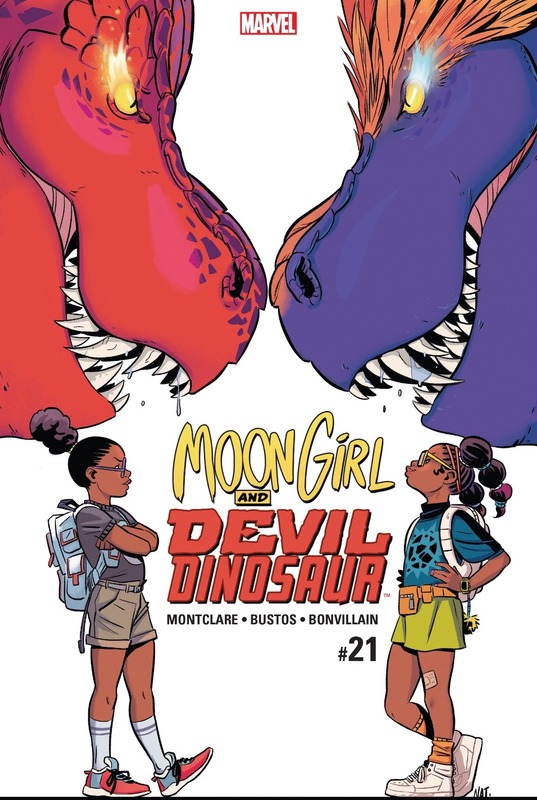 Devil Girl and Moon Dinosaur may look a good deal like there other-dimensional counterparts, yet rather than being a pair of super heroes they are actually super villains. Moon Girl and Devil Girl are not complete opposites of one another, but are dissimilar in some key ways. The alternate version of Lunella doesn’t seem to have a sense of curiosity to her at all. She doesn’t really care where this alternate version of herself has come from, she just wants her gone as quickly as possible. 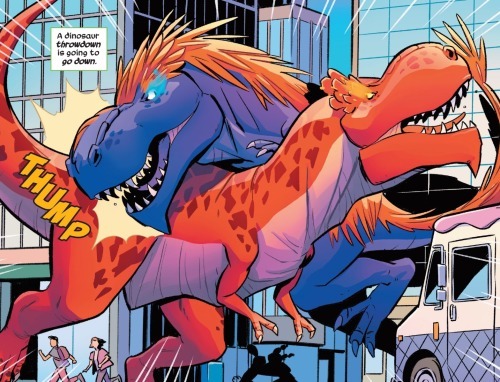 The bickering between the two Lunella(s) quickly results in a destructive battle between Devil Dinosaur and Moon Dinosaur. We don’t get to see how the two Dinos differ… other than the fact that Moon Dinosaur is purple as has feathered plumage (and yes the scientifically minded Lunella has in the past made reference to odd fact that Devil Dinosaur is cold blooded and lacks feathers despite the fact that most paleontologists concur that real dinosaurs were likely warm blooded and feathered). Anyways, the fight between the two sets of alternates goes nowhere fast and the real Moon Girl opts to run off and try to find a quite place to regroup and think up her next move. Such a respite is offered when she and Devil D run into the alternate versions of her classmates, Zoe and Eduardo. These two also significantly differ than their other dimensional counterparts. Eduardo is thoughtful and pensive rather than hyperactive and impulsive; and Zoe is self assured and unembarrassed as opposed to anxious and constantly mortified. From Zoe and Eduardo, Lunella learns that Devil Girl used to be much different. She was shy, nerdy and quiet, but then she found the magical Moon Dinosaur and now all she is interested is causing trouble. Lunella decides that she must put an end to the threat posed by her alternate self, but when she declare her intentions both Eduard and Zoe object. They explain that while Devil Girl is kind of a rotten kid they like her… she makes things interesting and in her own way has actually done a lot of good (such as when she scared off an alien invasion). There is clearly a rhyme and rhythm to this alternate world and Lunella catches on quick that it would be fruitless to try and change it. It is the way it is meant to be; the only thing out of place is her and Devil D and her best move, her only move, is to leave as soon as possible. The overheated Omniwave Projector has cooled and regained functioning, thus allowing Moon G and Devil D to take off and hopefully return to their home dimension. They say their goodbyes before leaving and Devil Girl, in her own gruff fashion, seems a bit disappointed by her alternate self’s sudden departure. Our Lunella’s parting words of advice to her other self is to more open to accepting the friendships of others, that allowing herself to open up to the important people in her life will likely result in her not always feeling so rotten. Who knows if this alternate version of Lunella will heed this advice or not… the matter is left a mystery as the Moon Mobil fires off into outer space. The beleaguered Omniwave Projector is fired up once again and through luck and skill Lunella is able to navigate her way back to her home dimension. yet she doesn’t return to earth just yet. There is still a matter that requires attended to. Lunella had initially set out into the stars to help Illa and she’s going to give the matter another shot. And the issue concludes with The Moon Mobile coming into orbit of a still anger Illa the Living Moon. A subplot runs through the issue focusing on the various robotic duplicates that Lunella had created to cover for her absence while she was off on this mission to the stars. In comics, creating robot doubles is almost never a good idea, it usually results in some sort of mayhem; and this looks likely to be the case with Lunella’s robot doubles as well. Although the doubles appear quite obviously to be robots to the reader, they appear to be convincing enough to fool Lunella’s teachers and classmates, even her parents. Yet the android double is especially cold to those around her, extremely curt with Lunella’s parents. Conversing with the disembodied DoomBot head in Moon Girl’s secret lab, it would appear as though the artificial intelligence that controls these robot doubles is beginning to question the meaning of its own existence. It is gaining sentience and you just know that this is going to make for some serious trouble in the not so distant future. 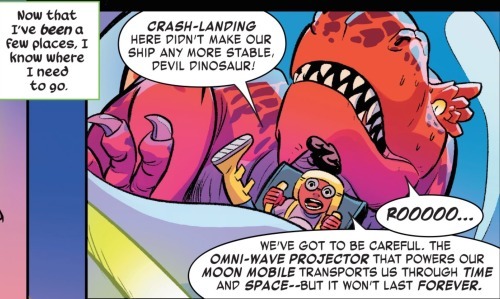 All and all another very fun installment of Moon Girl and Devil Dinosaur. The art by Bustos and Bonvillain is once more absolutely top notch. Natasha Bustos’ lifework is so ultra-confident, the action so fluid and Bonvillain’s color work so well synched that reading this book has come to feel like watching a really well done cartoon. The thematic of the story isn’t as strong in this particular issue as it has been in the past. Lunella’s meeting her other-dimensional double offered a lot of opportunity for introspection and self-discovery, but instead hinged on our Lunella realizing that her alternate self has yet to learn the same lessons she has… the truth she discovered in the ‘World’s Smartest’ story-arc. That truth being that mutuality is just as important as autonomy and that Lunella is much stronger, more capable and happier when she allows herself to let in and rely on others as opposed to feeling as though she has to do everything on her own. Moon Girl and Devil Girl’s origins are entirely similar. Both had been shy and nerdy types who gained powers and dinosaur sidekicks. Which begs the question, what has it been that caused this alternate version of Lunella to become such a brat, to choose evil over being a hero? 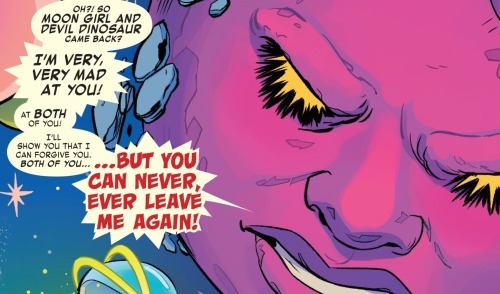 The answer is obvious, but left unsaid… which leads me to the one aspect of Moon Girl and Devil Dinosaur that has started to drive me a bit bonkers. Lunella has really great parents. It’s clear that they raised her right and this is why she has ultimately chosen to use her gifts and abilities to become a hero and help people. And yet Lunella has really been treating her mom and dad in a lousy way of late. The tensions between Lunella and her parents have been percolating for twenty-one issues now and I’m getting impatient waiting for it to boil over… I feel that a reckoning is long overdue. Granted, my feeling this way may be a facet of my being an adult reading an all ages comic. It is possible that younger readers aren’t at all interested in seeing a story where Lunella realizes she has been taking her parents for granted. Lunella is nine-years-old… pretty much in the thick of what developmental psychologists refer to as the ‘latency phase’ … the phase where the individual is transferring between childhood to young adulthood. It is in this phase that a child learns to act independently, to leave their parent or caregiver’s side and start to explore the world on their own. It’s a phase of a child’s life that can be especially difficult on their parents. It’s exciting to see one’s child grow and develop, but there can also a great sense of loss. Some children enter into latency with apprehension, they’re not sure if they are ready to do things on their own. Others, however, leap into it with the utmost of eagerness, excited to explore the world on their own. Lunella definitely fits into this later category and it is clear that the process has been especially difficult for her mom and dad. They seem to feel that their daughter has outgrown them and they feel left behind… as though they have lost their daughter. Mr. and Mrs. Lafayette having supper with an android duplicate of their daughter makes for an apt metaphorical representation of this dynamic, but I’m growing impatient to see the matter more fully addressed. The next issue looks to focus on Moon Girl helping out Illa the Girl Moon and her father, Ego The Living Planet, is set to feature in the issue. Perhaps the thematic of parent child relations therein will cause Lunella to realize how much she has taken her own patents for granted. We will see. While there are some aspects of the issue that bugs me as a grown up and child psychologist, it is nonetheless once more a joy to read and definitely recommended. Three and a half out of Five Lockjaws!